I imagine my legacy will include written instructions not to turn my favorite batik into a clown costume, but it will also include memories of my unquenchable optimism that there is indeed enough time left in the universe to organize my sewing room. Then there will be the UFOs. 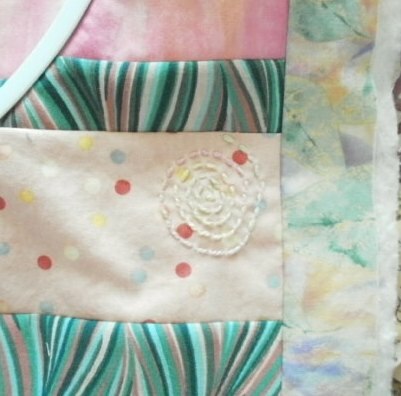 Paint, a stamp, blank fabric – what more could I want? 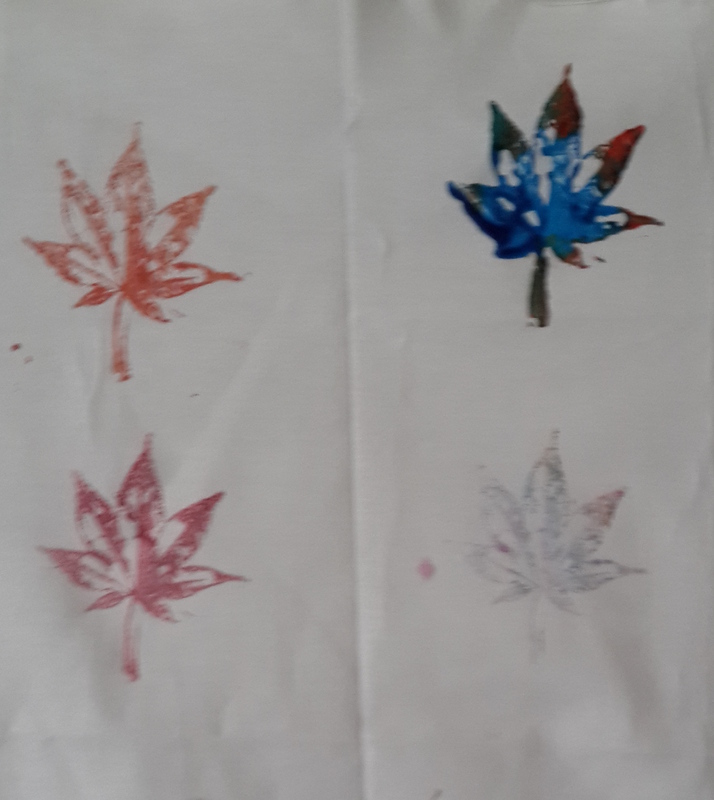 Someone may wonder what I intended to do with this grouping of leaves. That’s a very good question. Let me know if you’ve got an answer I can borrow. I hope I won’t have too many UFOs that elicit the blank stare followed by, “Oh no, she didn’t.” That’s what happened when I tried to rinse out what I expected to be disappearing marking pen from my grandmother’s embroidery UFO. Turns out it is there-until-the-stars-grow-cold ballpoint ink. Time to add some beads, I guess, or perhaps ribbon embroidery. Or maybe I’ll leave it as a warning to myself that some shortcuts really don’t work. 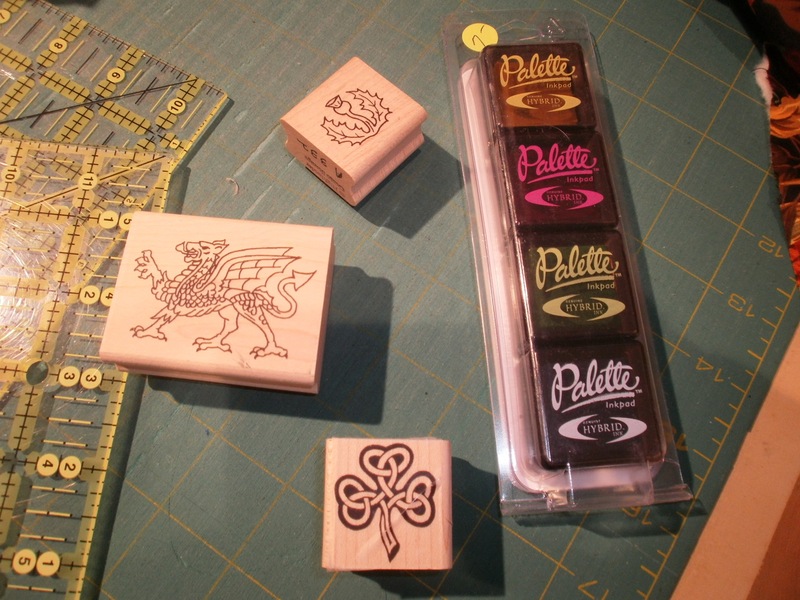 These are celtic-themed stamps and some glittery ink. I bought the set long enough ago that I can’t remember any of the details. I think it was at the Caledonian Club Scottish Games, and I suspect I had an idea for a project. I know my little hand stuffed them into my shopping basket because the ink is shiny and the designs are cool. I also know that the reason they were hiding under a pile is that I had another UFO with a more pressing deadline to finish before I could start the project that required stamping. Then they got buried. The good news is I still have an idea for a project that could require those stamps. 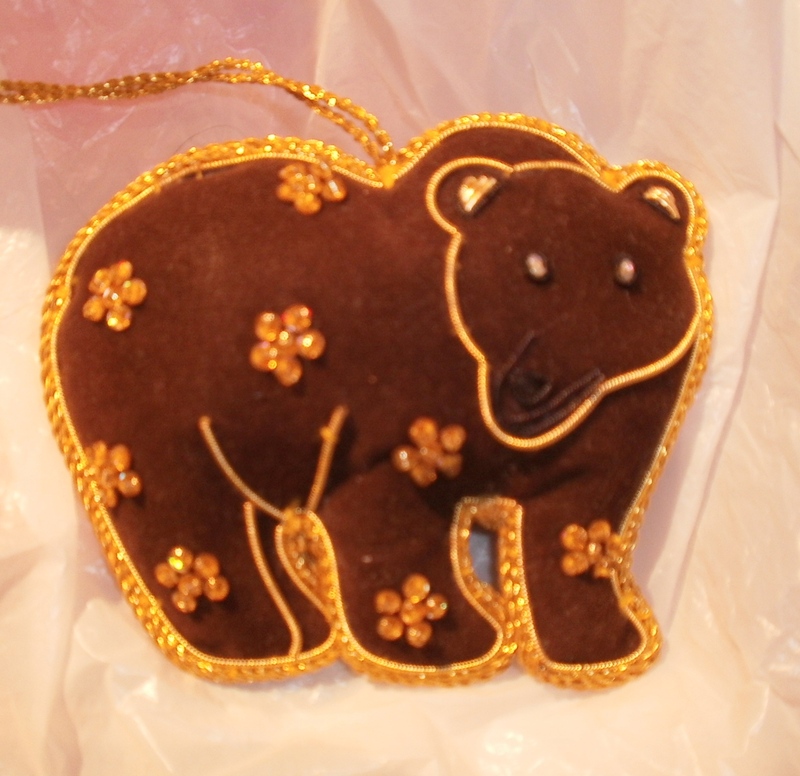 This is an ornament that I bought because it is shiny. And a bear. And shiny. The good news here is Christmas is scheduled for this December again so I will be able to put it on the tree. Perhaps by then the ideal quilting pattern for my mosaic tile quilt will make itself known and I can scratch one more UFO off the list. I woke up Tuesday morning with pieces that might be useful for my Challenge project. The meeting started at 10 am, and I am not a morning person. My best creative times don’t start until after brunch. 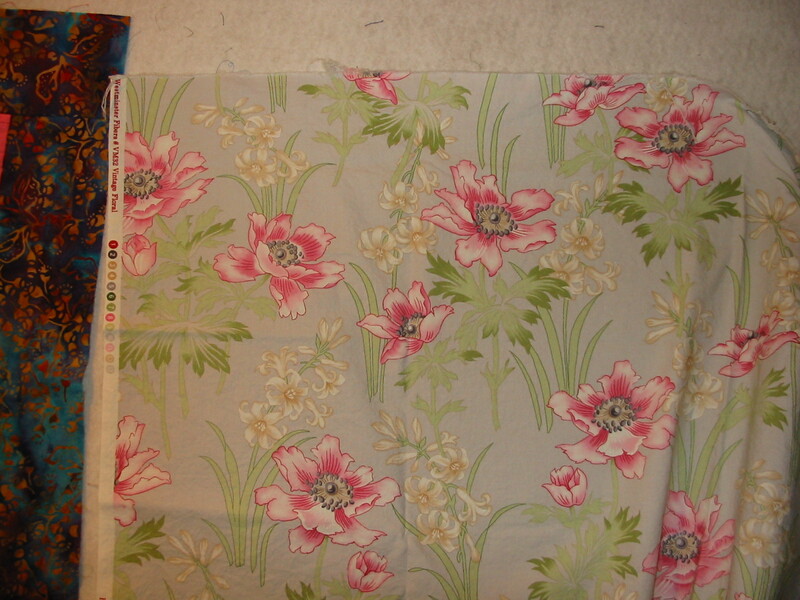 Still, I padded to the sewing room and stared at the stuff on the design wall. 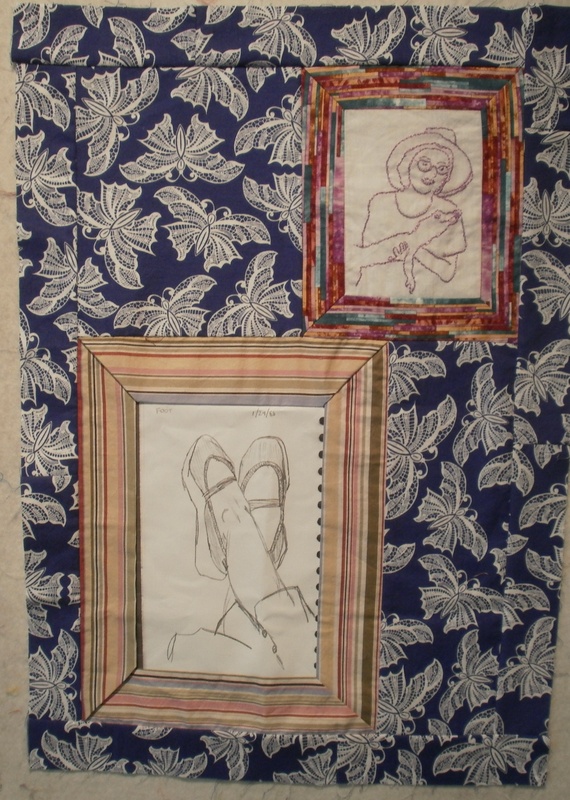 A thought wiggled itself into a plan – I could take the embroidered portrait, put it in a frame, and call it done. 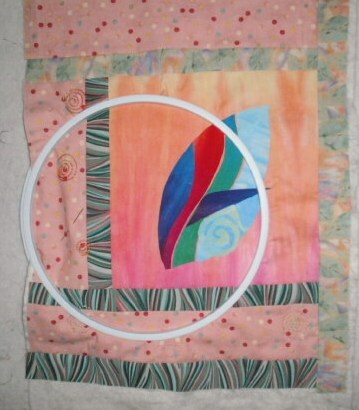 I found a frame that would work, sewed a border on the embroidered portrait, and tried to assemble the piece. The operative word here is tried. No matter what I did, it looked ghastly. Then the frame acquired a little chip, and I called it done. 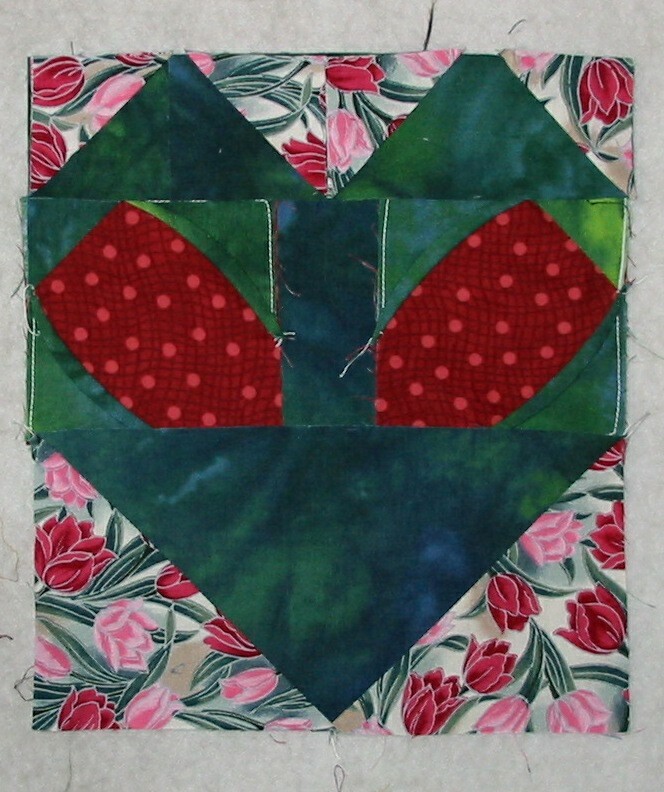 Plan B – I put a border around the foot drawing and auditioned fabric to create some sort of collage effect. 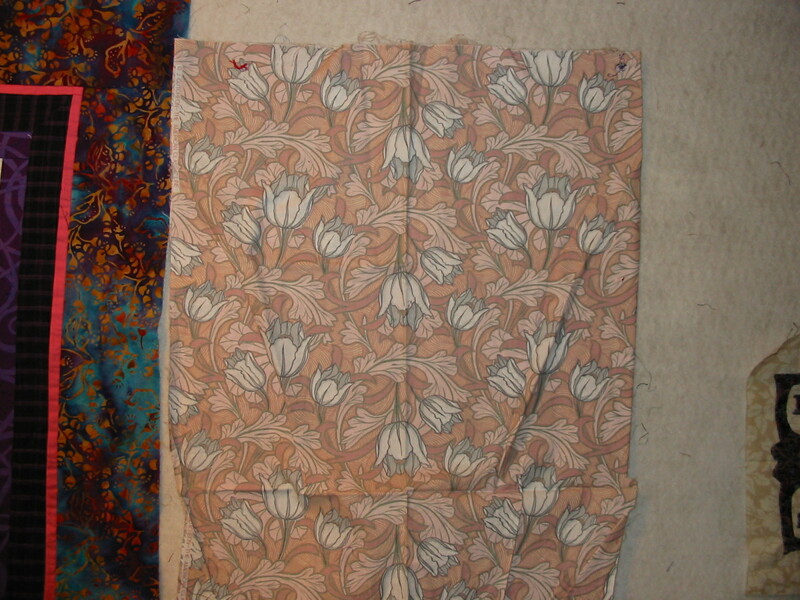 The first fabric looked like very old, very out-of-style wallpaper. Plan C – I went with the wallpaper. 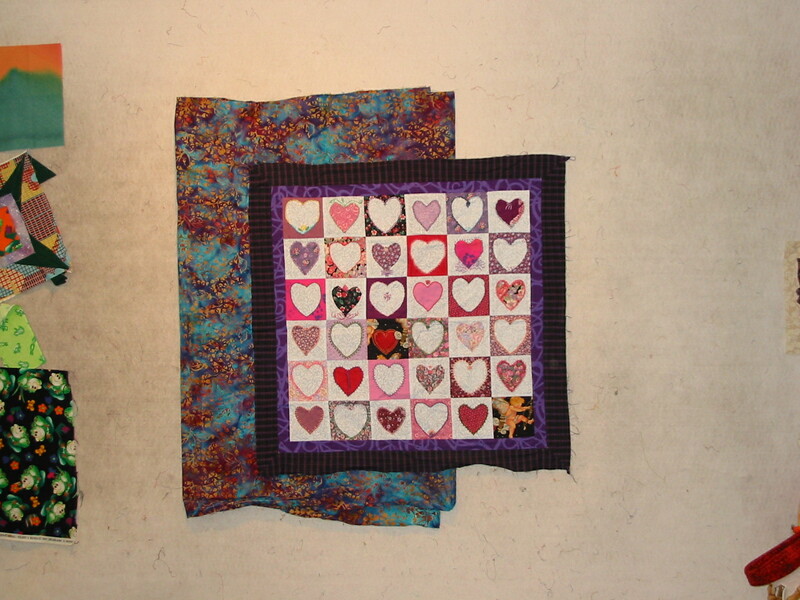 I have collections of small pictures which are hung in tight groupings, and that’s what this quilt is supposed to evoke. I finished in time for me to get to the meeting, so I’m happy enough. It wasn’t what I intended when I started the project, but that’s okay. 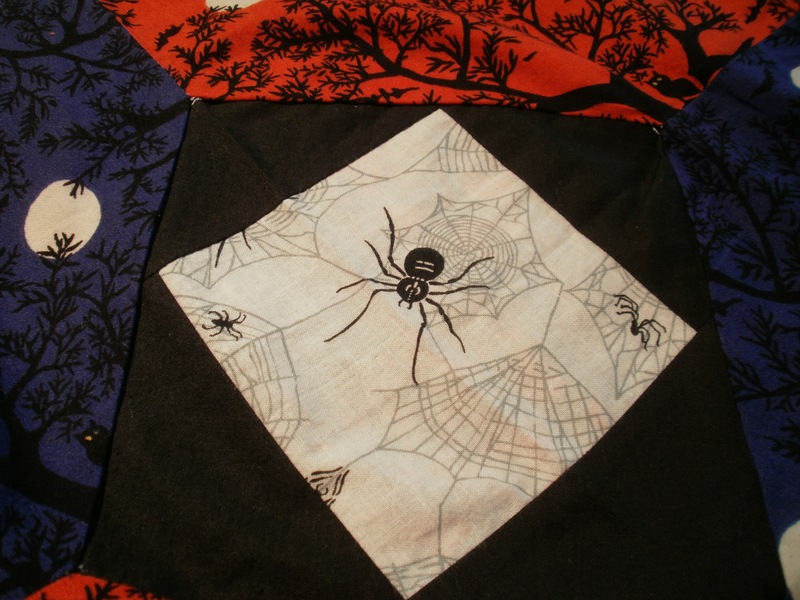 The top was long enough but not wide enough, but I had other Halloween fabrics that worked. A medium strip down the back was sufficient, and now one more UFO is done. I’m not counting how many are left to go. For the first time in three weeks, I turned on my sewing machine. Between waiting for my hands to heal and trying to keep up with other projects my trusty Viking hasn’t seen a lot of me. 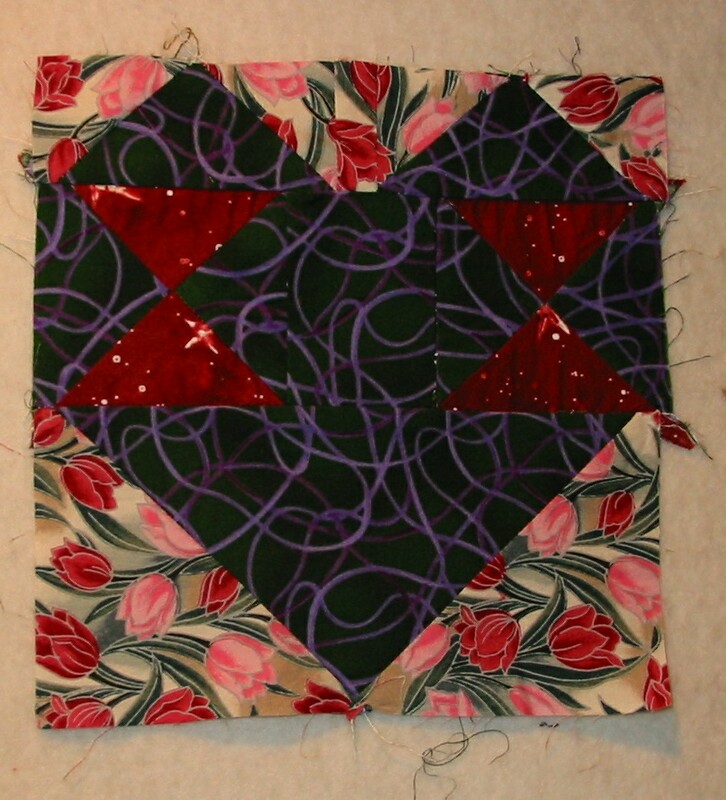 I think it was resentful, too, because my first seam was just awful – wibbly-wobbly doesn’t begin to describe it! 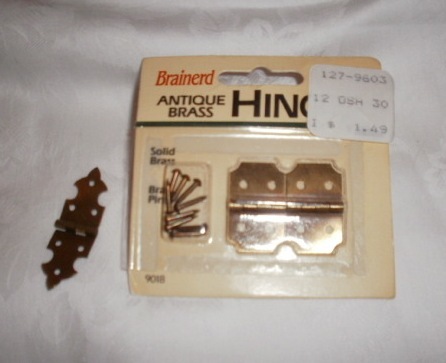 Then, since I am determined not to add to the UFO pile (at least this week), I started looking for backings. 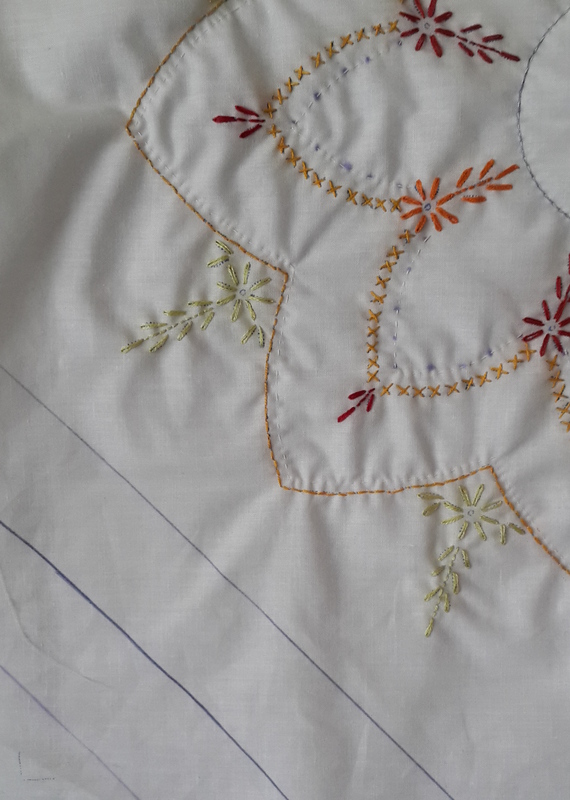 Those who have seen my quilts will tell you that I’ve never been bound by the convention that the back of a quilt should somehow correspond to the front. 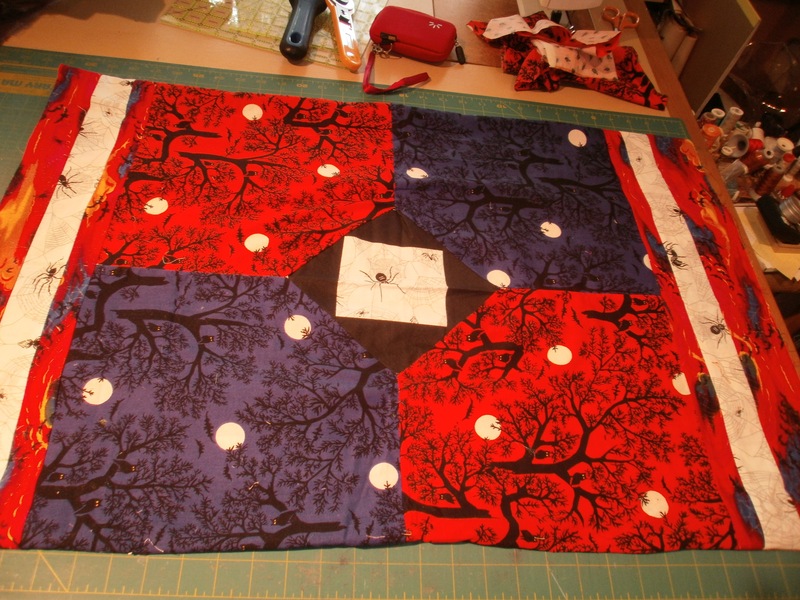 Very often, my quilts are backed by whatever was on top of the cutting table. So, instead of congratulating myself that I’m finally finishing up a project, I’ve got a newer, pushier project on my hands. 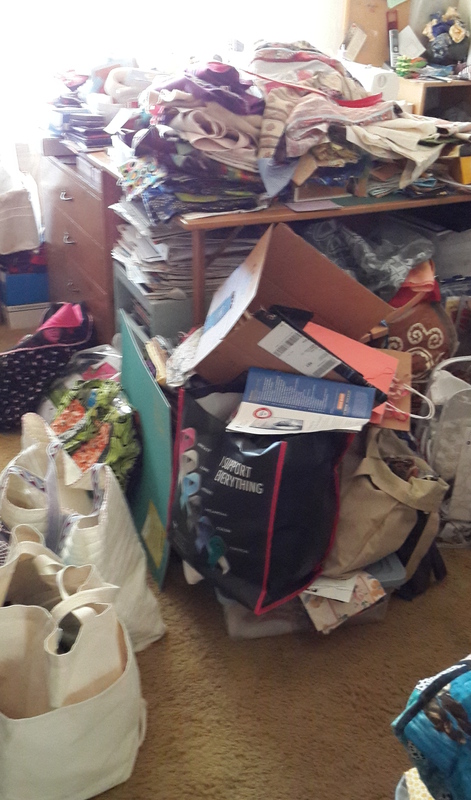 The life of a quilter is never dull. At the last meeting of a friendship group, one of the women challenged us to count up our UFOs. I tried that once and didn’t like the result. 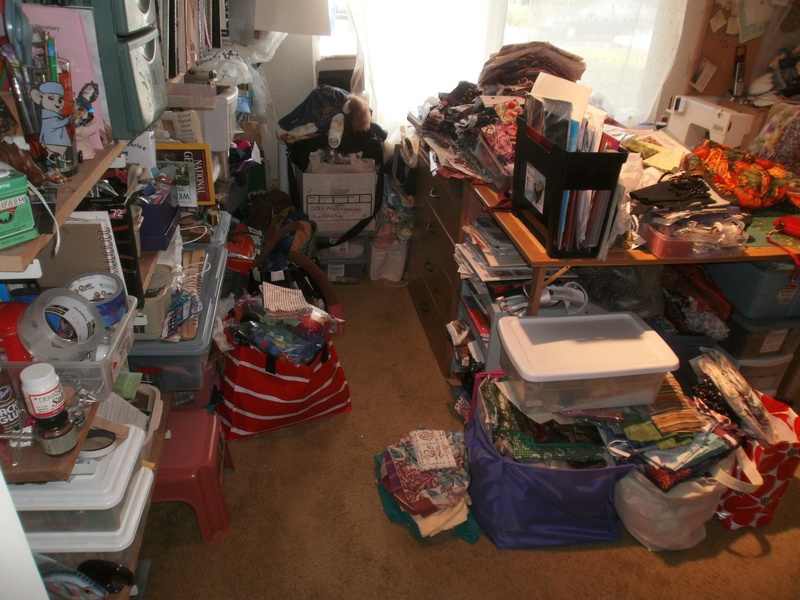 Still, a challenge is a challenge, so I pulled out all the UFOs in the corner of the closet. There are ninety-three (93) in this pile. 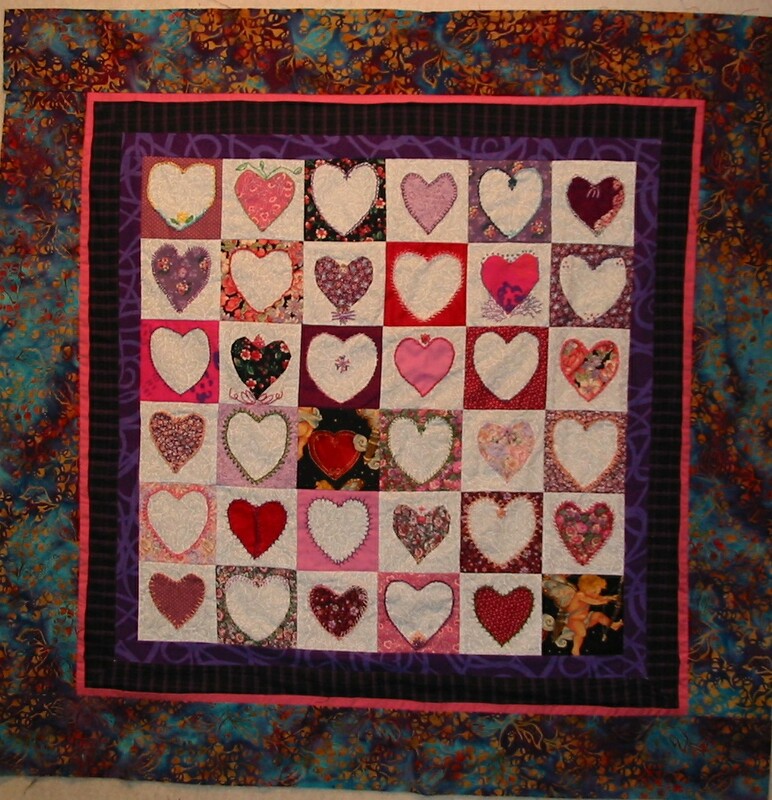 Not included are the three I plan to finish for the quilt show in April and the collections of fabric that are just waiting for a design. I guess not knowing exactly how many projects languished in the sewing room has made it very easy for me to make a new top and toss it on the pile. 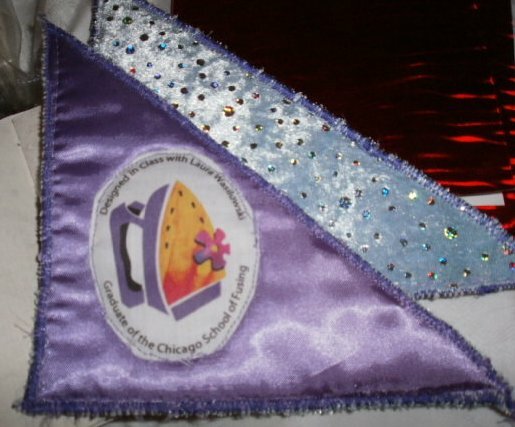 For the last couple of years I have used the bi-monthly Challenge meetings to tackle the stacks of fabric on the cutting table. Regardless of the theme, I was going to make it work with whatever was on top of the fabric pile. Perhaps I need to adjust that scheme and start finishing my UFOs for Challenge, using whatever is on the cutting table as a backing. 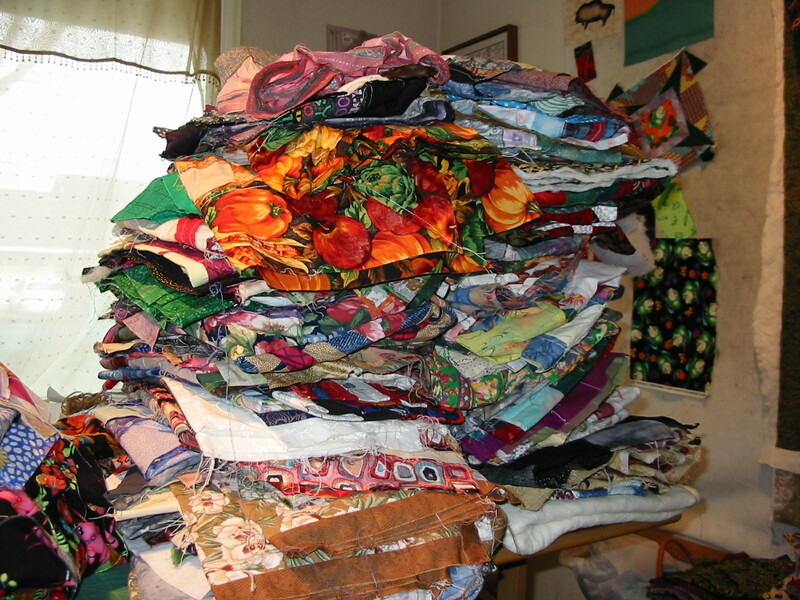 Of course, then I’ll need to figure out where to store the completed quilts, but that’s a problem for another day. I was cutting some donated fabric into squares, and came across a UFO. 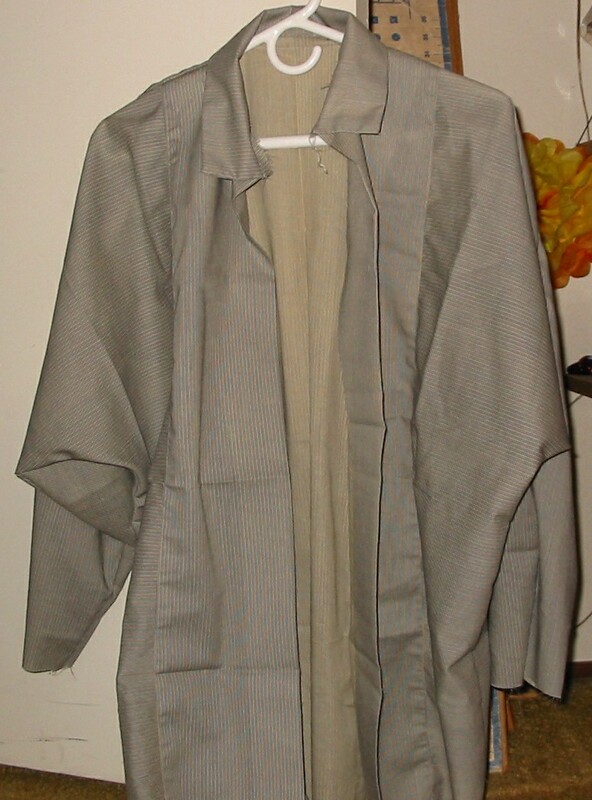 It was a shirt – cut, with interfacing attached, ready to sew. Literally, all that was left was to sew the two front pieces to the back and attach the collar. I stood there, rotary cutter in hand, and decided I couldn’t let it end this way. I don’t know why the shirt was never finished – maybe styles changed before it was completed, maybe the intended recipient’s color sense changed, maybe the person who started it put it down and forgot it, then moved it from one shelf to another until it was time for her to go to that great sewing room in the sky. Once I hem it I’ll have a work shirt. Every time I wear it, I’ll be reminded that the UFOs I abandon in hidden corners will resurface someday. My family will open box after box, exclaim “What was she thinking?” and move on. If a project is really important to me, I’d better get it done now. With that sentiment in mind, I decided to tackle the shelves at the back of the closet. I found fabric, of course, but also pillow cases to protect quilts that need to be shipped, a pair of wool pants that I wear when cross-country skiing, and a pile of shawls. 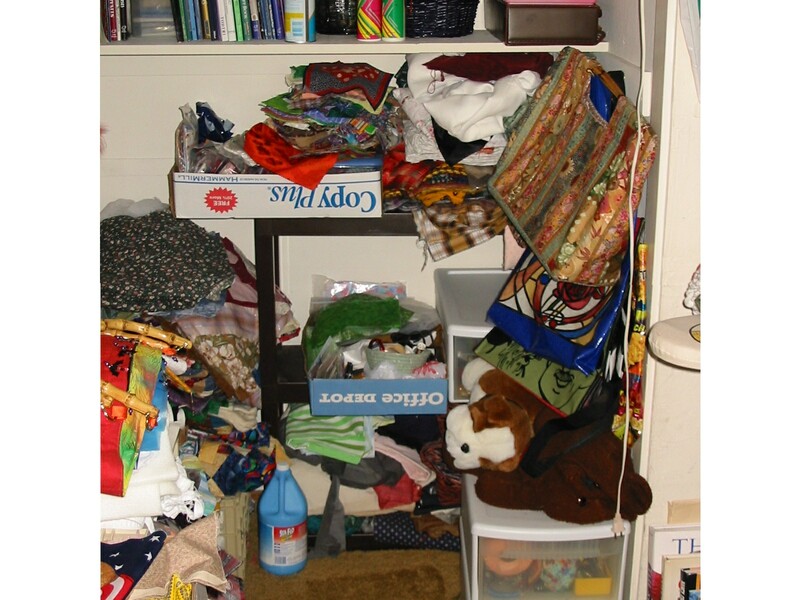 The pillow cases went back on the shelves, but in one stack instead of mixed in with other things. The wool pants may go to the thrift shop, since the last time I went cross-country skiing was about fifteen years ago and it isn’t likely I’ll be going this winter. The shawls are going in a spare dresser drawer, where they’ll be more protected. 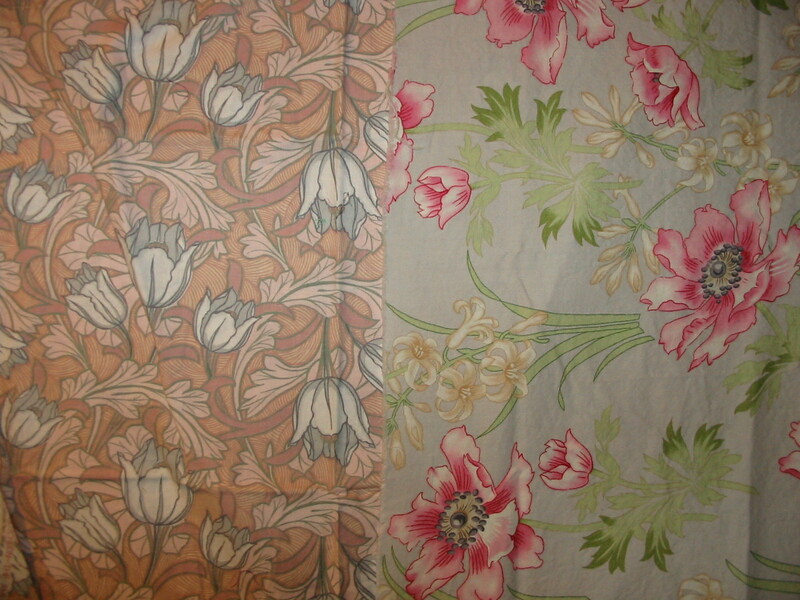 The fabric is still on the shelf, as are two trays of scraps that need to be sorted. Now that I can reach them, the chances of something useful being done with them just sky-rocketed. 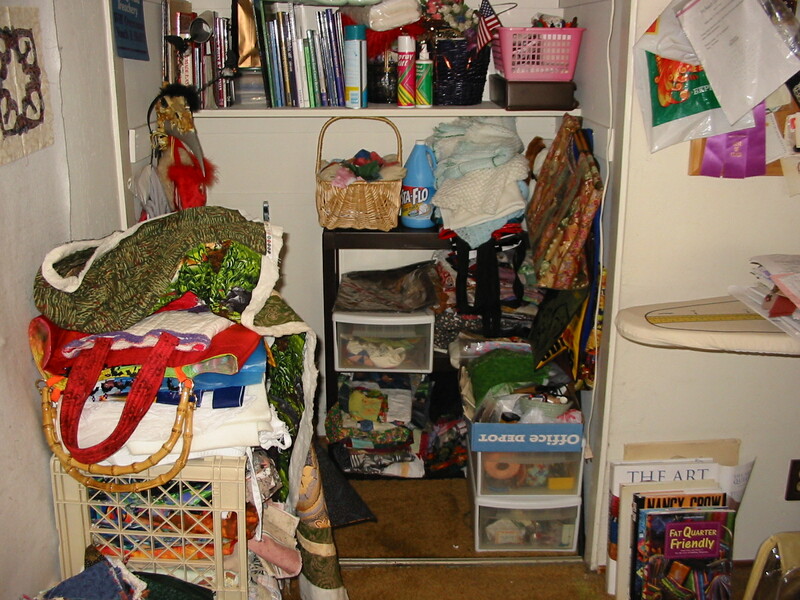 And – best of all – I have another couple of inches of maneuvering space in the closet. I still have many unfinished projects staring at me, but at least I can see them now. If I can save just one UFO from being shipped out to some unsuspecting quilter, it will be worth it. 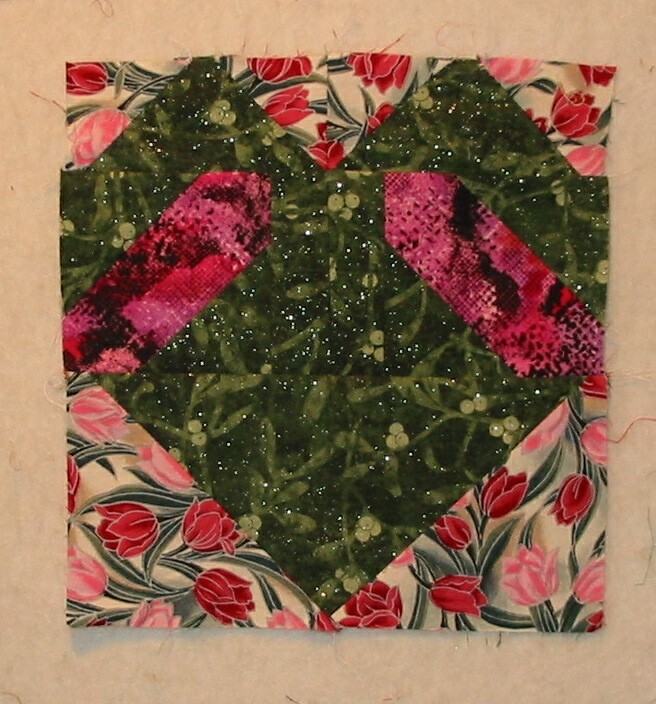 When Jan Steinhoff, Block of the Month coordinator for Amador Valley Quilters, announced that her husband thought the heart pattern she chose for February looked like an alien, was there any doubt I’d be buying a kit? The alien face effect is subtle. If you aren’t looking at the block from just the right angle – or don’t have the proper mindset – you might miss it. So I decided to kick it up a notch. 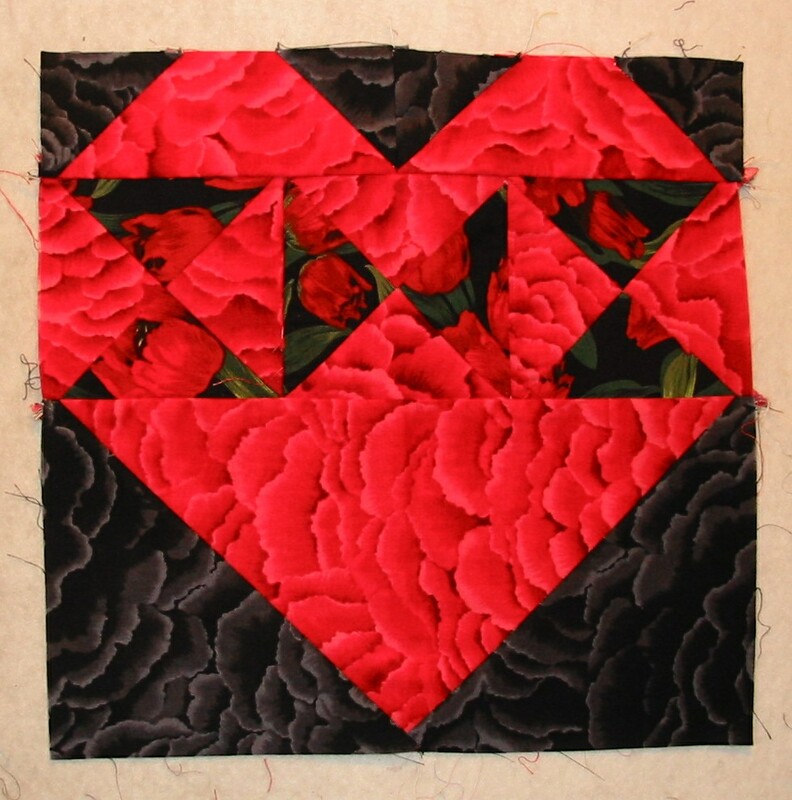 Since the kit includes a gorgeous red and black tulip print, I looked in my collection for something similar. 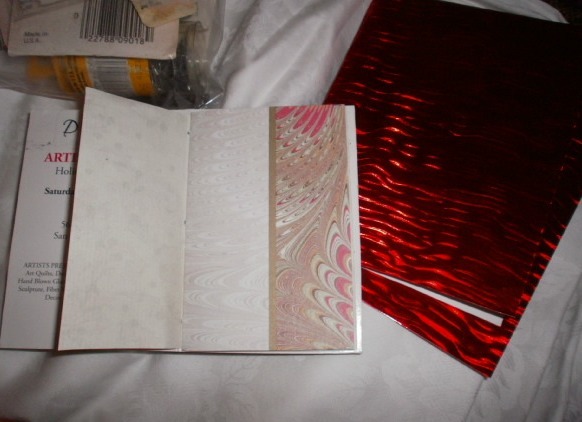 I found a pink and burgundy print and started looking for background fabric. After a few minutes, I dope-slapped myself. Why use the tulips for the alien face or eyes? 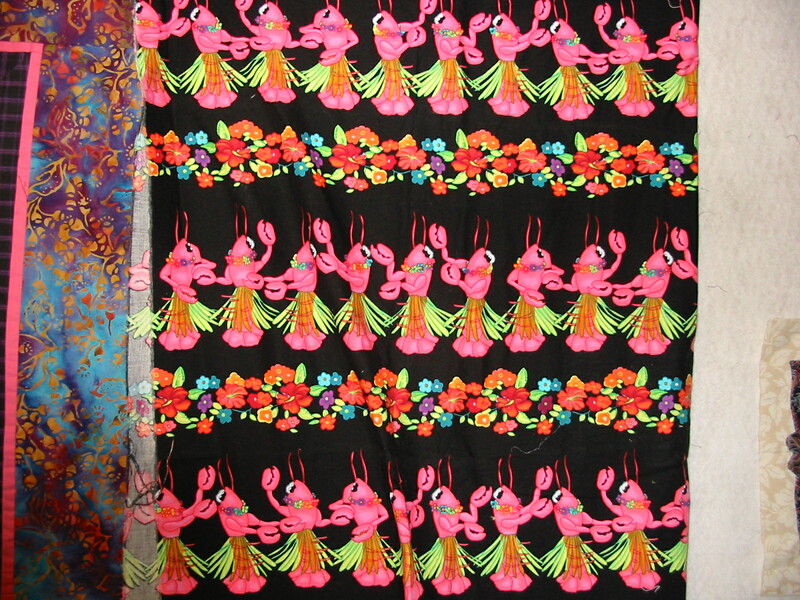 Obviously, it should be the background and the quilt needs to be titled Garden Variety Aliens. 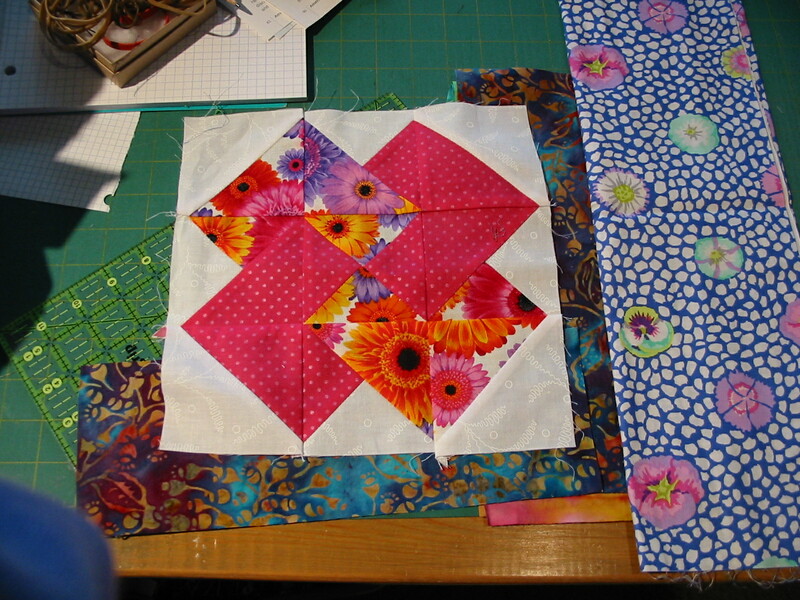 I have three blocks of each of the three faces, and – yes – I intend to finish the quilt. And display it. Maybe in a show near you. Be afraid, be very afraid. Oh, and let the UFO jokes begin.